The CubTug is a family event and our guests' safety is our top concern. Alcoholic beverages will not be provided, but are allowed, provided that they are consumed with responsibility and discretion. For safety reasons, we ask that alcohol not be consumed in the shop or on the pulling track and that none of our guests operates tools or tractors while under the influence. 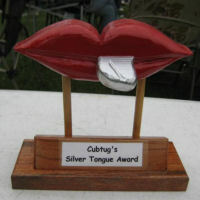 The Cub Tug is a non-competitive tractor pull exclusively for the Farmall/IH Cub and Cub Lo-Boy. It is sponsored by Doug and Bonnie Miller, the Ratliff Family, the town of Somerset and the South Eastern Ohio Garden Tractor Pullers Association. The pull is for entertainment purposes only - there is no entry fee and no prize purse. The "winner" earns only bragging rights and gets to provide a home the coveted "Golden Shaft" trophy for a year. Don't own a cub or can't bring yours? Well, come anyway and watch these tiny giants go at it - just watch for slinging mud - and, trust me, we don't mean from the track! Ask, and you may even be able to "borrow" a cub to try it yourself. 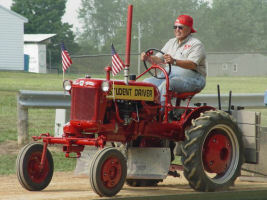 The same driver can participate on more than one tractor, and each tractor can have more than one driver, but each unique driver/tractor combination may participate only once. The Requisite Disclaimers: Stock and restored cubs and Lo-Boys are preferred. 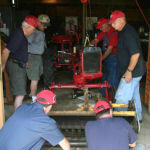 Participants must hook to the sled using the factory hitch point, and fast hitch tractors must limit their drawbar height to that of a standard cub. Children 8 and older may participate with their parent's permission and supervision, provided they can safely operate the tractor to the satisfaction of the event sponsors. All drivers participate at their own risk and at the discretion of the event sponsors, who accept no responsibility for injury or property damage and reserve the right to refuse participation by any driver or tractor. Friday night we close with a family friendly barn party featuring our friends Rosie and Tom Tootle, with Tootle's Karoake and DJ Services. They will be spinning the latest hits and allowing you to become a star. Saturday night we close the Cubtug with a family friendly barn party and concert featuring Nashville Singer-Songwriter Sara Simmons. Her songwriting is a breath of fresh air in todays country music world. Sara has performed at StoryTellers famed Saturday Nights in Hickman County on the same "Little Stage" that Johnny Cash made famous. She has also performed on the World Famous Station Inn stage with the likes of Carl Jackson and Larry Cordle. Doug Miller opens his well-equipped shop for our guests to get their Cubs in top pulling form, install implements, fix issues or just learn more about Cub maintenance. Lending a helping hand is the name of the game and our guests include experts in mechanical and electrical issues. Food, Food and... Oh Yeah, More Food! Lildog's Mongolian-style Omelet Buffet - On Saturday morning, we take a page from Gengis Khan and let our guests feast like warriors on made-to-order, 3-egg omelets packed with the meats and vegetables they select. Eggs cooked to order and other breakfast staples will be available. We ask that our guests bring nothing but their appetites. Potluck Dinner - Kick back, rest your heels and boast about your win (or whine about your loss) while you sample the best of what our guests have to offer, along with some fresh fixin's of our own. All day - Early arrivals, setup and shop time. 6 p.m. - Potluck & Barn Party featuring Tootle's Karaoke. They'll be spinning the latest hits and allowing you to become the star. *Cub Tug activities will take place at the Somerset Memorial Park located approximately 1/2 mile south of the village square off of South Columbus St. All other activities will take place at the Miller's, 416 South Columbus St. Sponsored by the Miller and Ratliff Families and the South Eastern Ohio Garden Tractor Pullers Association.